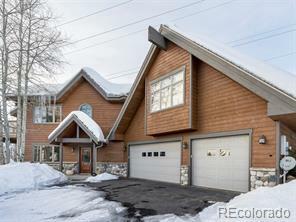 In a subdivision just minutes from all of Steamboat recreation sits a grove of aspens on a 0.62-acre lot that surround a truly D-style log home. This haven of mature trees and manicured landscaping sets the ideal cozy mountain setting for this 3,600 sq. ft. home offering 4 bedrooms, 4 baths with tons of living space. The gorgeous multiple log decks, a covered porch and a built-in hot tub offer the perfect ambiance in absolute seclusion without compromising views of the Ski Area, south valley and Emerald Mountain.